ONETOUCH eat It is the ideal solution for any restaurant is to approach for the first time in the world of electronic account with the use of the touch screen, or the electronic controls. through the use of touchscreen connected to each other in the halls with steel tumbler for waiters or by means of electronic notebooks in use to the same, that without leaving the room comfortably transmit the commands in the wards and the checkout . 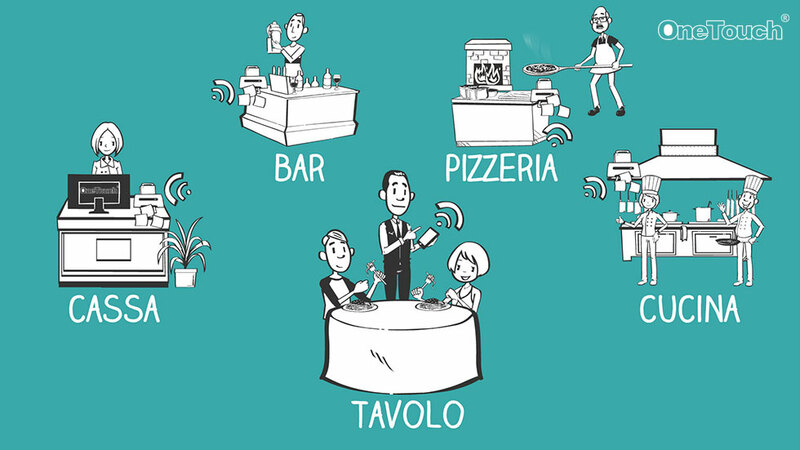 Successfully used in hotels, restaurants, gourmet restaurants, sushi restaurant, bingo halls pizzerias, bars, pubs, ice cream parlors, cafes and disco bars. with unauthorized transaction in the production centers (kitchen, bar, pizzeria and cash for the bill). Management bar codes, management variants, fast receipt, home management. personnel management through a special card which, in addition to recording the entrances and exits, allows you to manage the employee self-consumption. quick and easy control of the asset. in order to allow the property total control of the case and of the movements. made with the best VPN technology products. E ‘can then remotely control all outlets with its data transfer. displayed on the interface of the program graphics. This allows to obtain immediately the situation of the tables. the application of discounts, offers, cancellations and adjustments in relation to the permissions assigned to the group of operators. E ‘can be identified as “sold out” one or more products. with the predetermined price management or in proportion to the individual components. 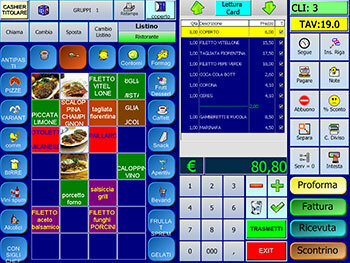 POS configuration in touchscreen mode: management of points of sale to the public such as Bar, Case, Input, Take-away.